Pronounced as if it began with the letter z, the use of "xeriscaping" originated with the Denver Colorado Water Department in 1981. A compound of the Greek xeros, dry, and "-scape," as in landscape, "xeriscape" landscaping essentially refers to a creating a landscape design that has been carefully tailored to withstand drought conditions. Xeriscape landscaping can take many forms. For some landscapers, xeriscape landscaping simply means grouping plants with similar watering requirements together on the landscape. This makes for more efficient watering. 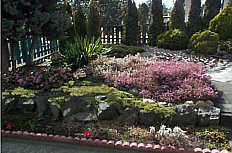 For more information on how to create a Xeriscape, a publication found on the Massachusetts Master Garden Website.